The Buddy Walk® was developed by the National Down Syndrome Society (NDSS) in 1995 to celebrate Down Syndrome Awareness Month in October and to promote acceptance and inclusion of people with Down syndrome. 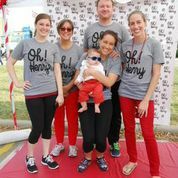 Amy, Samantha & Dr. McCarthy were excited to participate in the 2014 Columbus area walk in support of our friends, family members and patients who are affected by Down Syndrome. 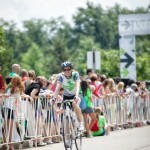 Dr. McCarthy was honored to have ridden, for the second year in a row, in Pelotonia 2014. 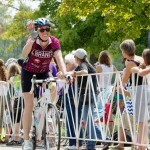 For those who are unfamiliar with the event, it is a charity bike tour founded in 2008 with One Goal: End Cancer. 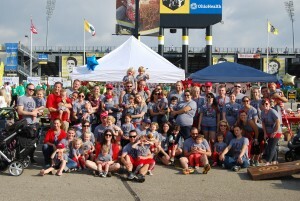 All operating expenses are covered by corporate sponsors so that 100% of every dollar raised goes directly to fund cancer research at The Ohio State University Comprehensive Cancer Care Center. Dr. McCarthy rides for her friends, family members, and patients whom we have lost as well as those who are currently fighting or whom have beat this terrible disease. 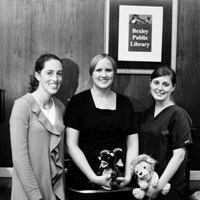 Dr. McCarthy, Sarah & Samantha participated in a story hour for 1-2 year-olds which focused on teeth. 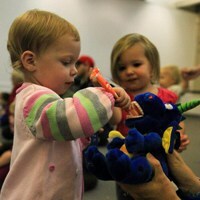 They read tooth-themed books, demonstrated brushing technique, had the children practice brushing teeth on stuffed animals, and answered questions related to children’s oral health. 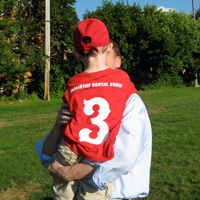 McCarthy Dental Group enjoys supporting local activities – from sponsoring a summer little league team to supporting area school sports teams and supporting a neighborhood community social. 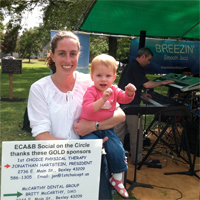 Having grown up in Bexley, Dr. McCarthy finds there is no place like home on the 4th of July! 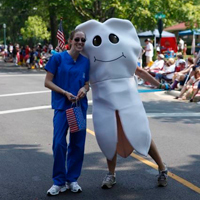 She was excited to have the opportunity to walk in the Bexley July 4th parade, passing out sugar-free gum and waving to many of her patients. We found that a lot of the children enjoyed running out and hugging the tooth. It was a great day (though incredibly hot!) & we look forward to participating in future parades.